evolved into a first class full service marine facility with floating piers and over 100 slips. Weaver’s Marina has all the things you expect in a first class facility: floating piers, a fully stocked marine store, complete repair services, climate controlled private bathroom/showers, fuel dock, satellite TV and high speed/WiFi internet. The wave attenuating pier offers protection from the weather and a state-of-the-art surveillance system gives peace of mind. Upgraded water and electric lines bring all the conveniences of home to your slip. Extensive landscaping makes the marina picture perfect. Cox’s Point State Park is right next door. Picnic in the pavilion, send the kids to the playground, fish for a bit or just enjoy the wildlife of the Chesapeake. Come by for a closer look - you will be surprised what a difference the details make! 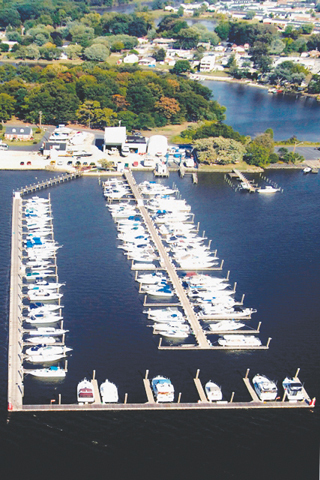 Weaver’s is proud to be named a “Maryland Clean Marina” that complies with the high standards set by the Maryland Department of Natural Resources to protect the environment. Weaver’s Marine Service strives to be environmentally friendly.